By rhwimmers, December 11, 2018 in !! !FRAG SWAP 2019!!! @Salthead Available at the event my friend. Looks like a great line up of raffles for this event. Grab your raffle tickets in bulk early everyone! Thanks! Looks like a great time! Check out the INDMAS facebook page for some great pictures from the SWAP yesterday. I personally want to thank all the vendors, hobbyist members and staff without all of you the best swap in Indiana would not have been possible. A big shout out to our Platinum Event Sponsor The Reef whose time and generosity assisted both the club and many other vendors that attended. 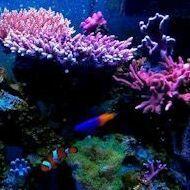 From bringing water for vendors and hobbyist use, to the grand prize reef tank . And the under 13 reefer that won the innovative marine tank donated by Premium Aquatics had the biggest smile on his face when he came up to claim his prize. A great 2019 swap and the planning begins for an even better 2020 swap! And one more shout out to Sanjay Joshi whose presentation before the swap started was so well received. For those that do not know speakers such as Sanjay do not come to these event for money. Instead they come for their love of the hobby and wanting share what they have learned through their years of experience. If you attended his presentation and learned something send Sanjay a quick note to thank him for his time and efforts. Just wanted to say I had a blast yesterday helping where I could and talking to people who love the hobby as much as I do. Honestly I still don’t know a lot of you, but to those that I do you have always made and my girls feel welcome. Can’t wait for next year! Thanks to everyone that puts in so much hard work behind the scenes, and to the vendors for participating. Good job with the swap this year staff and volunteers! Wanted to check on numbers for the swap...new members, overall attendance, swap revenue etc? I just became a member a few months ago, and attended the swap for the first time. All I can say is wow! The time, and energy, that must have been spent on that! Awesome job to all involved! Looking forward to the next event!